UN ambassador Susan Rice, widely considered the President's top choice to replace Hillary Clinton, was grilled by the Senate Tuesday. She acknowledged she had been wrong to say Benghazi was a copycat attack and continued to blame the CIA for providing her with that information. NBC's Andrea Mitchell reports. UPDATED 12:35 p.m. ET -- Republican senators emerged from their meeting Tuesday with United Nations envoy Susan Rice saying they were more disturbed than before the meeting about the misleading explanation she gave after the Sept. 11 attack on the U.S. consulate in Benghazi, Libya, when Rice said in TV interviews that the violence was due to an anti-Islamic video that was circulated on YouTube. Rice, a potential nominee to replace Secretary of State Hillary Clinton, met with Republican Senators John McCain, Lindsey Graham and Kelly Ayotte. The three senators have been among the harshest critics of the administration's handling of Benghazi and all spoke with reporters following Tuesday's meeting. “It is clear that the information she gave the American people was incorrect when she said that it was a spontaneous demonstration triggered by a hateful video. It was not, and there was compelling evidence at the time that that was certainly not the case,” said McCain. In the Sept. 11 assault on the consulate, Ambassador Chris Stevens and three other Americans, Glen Doherty, Tyrone Woods and Sean Smith, were killed. 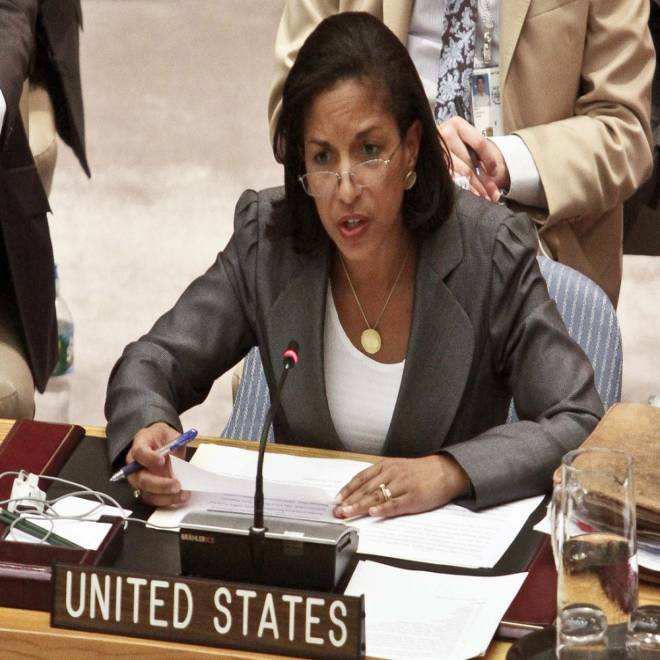 United States Ambassador Susan Rice speaks during a meeting on Syria in the United Nations Security Council on Thursday, Aug. 30, 2012. He invoked the example of President Bush’s nominee to be UN ambassador, John Bolton, who was blocked by Senate Democrats and a few Republicans in 2005 and 2006, implying that if Rice were nominated to the secretary of state Republicans would likewise block her confirmation. Ayotte, too, said she was “more troubled” after meeting with Rice and Acting CIA Director Mike Morrell than she was before the meeting. She questioned why Rice would have relied on unclassified CIA talking points in her TV interviews on Sept. 16. “When you’re ambassador to the United Nations you go well beyond unclassified talking points in your daily preparation responsibilities for that job and that’s troubling to me as well,” Ayotte said. U.S. Ambassador to the United Nations Susan Rice recaps the causes and effects of recent violence against Americans in the Middle East. In a statement released Tuesday afternoon, Rice said that she and Morrell had explained to the senators in the meeting Tuesday that "the talking points provided by the intelligence community, and the initial assessment upon which they were based, were incorrect in a key respect: there was no protest or demonstration in Benghazi. While, we certainly wish that we had had perfect information just days after the terrorist attack, as is often the case, the intelligence assessment has evolved. We stressed that neither I nor anyone else in the Administration intended to mislead the American people at any stage in this process, and the Administration updated Congress and the American people as our assessments evolved." Sen. Bob Corker, R-Tenn., who is in line to become the senior Republican on the Senate Foreign Relations Committee in the new Congress that convenes in January, said Tuesday he sees Rice as a party loyalist. The Senate has not voted to reject a nominee for a Cabinet position since 1989 when it voted down President George H.W. Bush’s nomination of John Tower to be secretary of Defense. Unlike that case, the Senate is now controlled by the president’s own party. NBC News’s Frank Thorp contributed to this report.